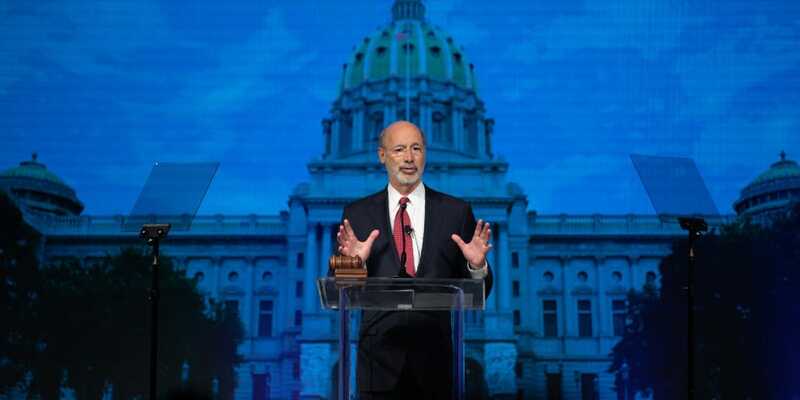 Hershey, PA – Today, Governor Tom Wolf addressed thousands of local officials at the Pennsylvania State Association of Township Supervisors’ Annual Education Conference to outline how Restore Pennsylvania will benefit townships and overhaul Pennsylvania’s infrastructure. The massive rebuilding plan funded through a commonsense severance tax will address townships’ needs through funding vital, local infrastructural projects. Restore Pennsylvania will invest $4.5 billion over the next four years in significant, high-impact projects throughout the commonwealth to help catapult Pennsylvania ahead of every state in the country in terms of technology, development, and infrastructure. Encompassing new and expanded programs to address five priority infrastructure areas including high speed internet access, storm preparedness and disaster recovery, downstream manufacturing, business development, and energy infrastructure, demolition, revitalization, and renewal, and transportation capital projects, Restore Pennsylvania projects will be driven by local input about community needs. Projects identified by local stakeholders will be evaluated through a competitive process to ensure that high priority, high impact projects are funded and needs across Pennsylvania are met. Support for Restore Pennsylvania is gaining momentum. Noting its undeniable benefits, the most ambitious infrastructure plan in generations has received public praise and official endorsements across the commonwealth. View the full Restore Pennsylvania plan.